When we established the Welsh Hawking Centre in 1980 the breeding of raptors was high on my list of priorities. Whilst we had bred a few birds before coming to the centre, we had several ideas that required a large amount of time to put into practice. These ideas have now come to fruition, with the Centre being one of the premier breeding establishments in Europe, if not the world. 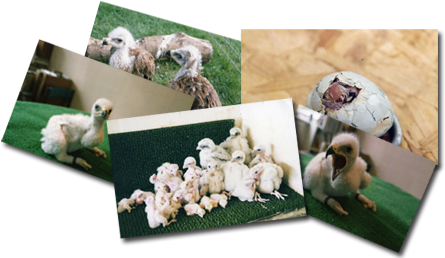 Here, at the centre we breed approximately 200 young raptors a year using both natural breeding and artificial insemination techniques. People come from all over the world to learn the artificial insemination techniques that we have developed. If you visit the centre during the breeding season, March to July, you will see many young birds in all stages, from a few days old to those just learning their craft of flying. The majority of the babies we hatch are incubated artificially. Once the eggs have hatched we make the decision whether to hand raise them or put them back with foster parents or their real parents. If we hand raise them, they will develop to be Imprinted Birds and will need to be artificially inseminated when it becomes their turn to breed. If they are put back with their parents before they are 10 days old, when they become old enough, they will naturally breed in pairs.